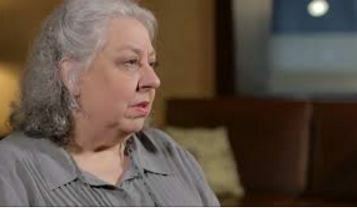 Jayne Houdyshell Triumphs in Bways’ “The Humans”! Jayne Houdyshell, an actress I’ve always found astonishing, reaches the peak of her long career in Broadway’s newest and most unlikely hit, “The Humans.” Houdyshell had a two decades long career in regional theater and was “discovered” in mid-life as the mother that couldn’t stop criticizing her lesbian daughter in Lisa Kron’s break-through play “Well” that started at the Public Theater and moved uptown to Broadway. And Broadway has pretty much been her home ever since. Houdyshell is the kind of actress playwrights dream of and though she has won tons of awards( the Drama Desk gave her a career achievement award a few years back), I can’t remember her having a leading part like the one she has now, and in a hit play to boot. “The Humans” is powered by her powerhouse performance as Deidre Blake, again a mother, but this time an Irish Catholic mother to end all mothers. Deidre is caught between a rock and a hard place as she tries to hold her unwieldy family together as they embark on a tumultuous Thanksgiving gathering in her daughter’s duplex in Chinatown. It’s one of the best plays of the year. Playwright Stephen Karam has written what all of the American theater has been longing for. A great new American play. Set today, it’s totally current and absolutely vital, and unflinching in its’ detail of the lives we New Yorkers, we humans, live . With horror film and Internet references galore, Karam and the titanically talented director Joe Mantello ingratiate “The Humans” into your soul and invite you to be a member of this troubled family. They hook you into sitting down to Thanksgiving dinner with the at-first-glance very bland Blakes, and there you are experiencing something that you’d never thought you’d be experiencing, a top-level, quality evening in the theater, by some one who’s now going to be considered one of America’s important young playwrights. What a joy this is to discover so much talent in one place, at one time, doing the thing it should be doing, bringing us the best in theater! Which is what Broadway is supposed to be doing. After all, shouldn’t that be going on all the time on the Great White Way? And so seldom is.”The Humans” is so good, it’s shocking. And to have the majestic Jayne Houdyshell at the top of the bill, guiding this ship into port, as it were, with a superb ensemble who are all excellently cast and doing what sounds easy, but is really almost impossible, make you believe that they are the Blake family and you’re a friend, who they’ve also invited over for Thanksgiving dinner. But little did you know what you’re in for! Folding chairs, card tables and paper plates and cups. And not a turkey in sight! Only health foods! Reed Birney is perfect matched as Deidre’s troubled husband Blake. Lauren Klein, is simply amazing and amazingly simple, as Deidre’s wheel-chair bound, dementia-ridden mother “Momo”, Cassie Beck & Sarah Steele as their struggling daughters, one gay and one straight, and Arian Moayed as the genial, still not married, but living together sort-of son-in-law. 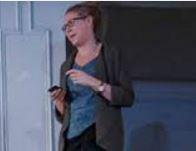 Cassie Beck, in particular, (above) as the frazzled lesbian lawyer daughter,Aimee, who is going through a difficult break-up with her lover. And it is to “The Humans” great credit that the Blake family treat this as something to be compassionate about and otherwise her sexuality is totally accepted in a refreshingly matter of fact way. 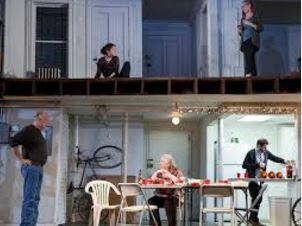 At one point Birney’s character quips, noting his daughters’ obsession with health foods, “If you’re so miserable, why do you want to live forever?” “The Humans” is so good it will restore your faith in the American theater and make you want to live forever, too, so you can see it over and over and over again. What a joyful surprise this play, Jayne Houdyshell and this production are!